To celebrate passing the Fifty Two Foods midpoint, yesterday Jen and I threw a little dinner party featuring the best recipes from the first 26 weeks. Since it was Bastille Day, I decided to include a surprise French dish of whole spit roasted rabbit. 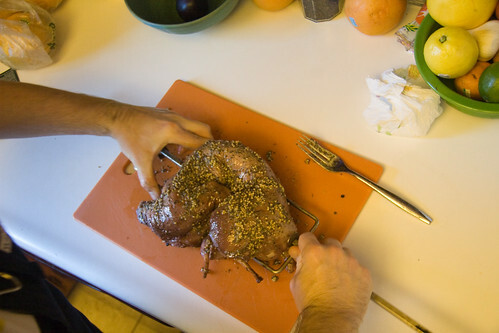 Though rabbit is a fairly ubiquitous game animal, enjoyed in much—if not all—of Europe, and not uncommon in the U.S. either, it has been forever tied with French cooking for me since seeing the fantastic rabbit skinning scene in Le Grand Chemin when I was young. After a failed attempt to get a rabbit from Cache Creek Meat, I called a couple butcher shops and tracked down a three-plus pounds specimen at Ver Brugge in Oakland. My rabbit was raised by the Rabbit Barn in nearby Turlock, California. Ver Brugge has been my family’s go-to meat source for as long as I can remember. It was likely the source of 80% of the fish and meat I ate before age 18. Until the fantastic Laurelhurst Market opened, I spent many years in Portland chagrined at how often I had to visit grocery stores for meat rather than a true butcher. 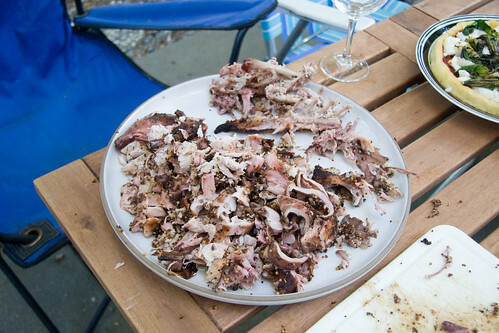 The one time I cooked rabbit previously, Easter 2004, it came out a little dry. To avoid this fate, I planned to go with a one-two punch of a marinade for moisture, followed by a mustard paste while it cooked. For the marinade, I went with a slightly simplified version of fellow Reed alumni Steven Raichlen’s French Game Marinade from Barbecue! Bible Sauces, Rubs, and Marinades, Bastes, Butters & Glazes. 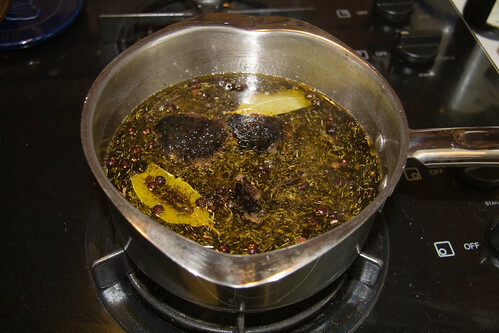 The marinade is a mix of red wine, olive oil, balsamic vinegar, juniper, thyme, garlic, black pepper, clove, bay leaf and a splash of gin. I cooked the ingredients in a pot ’til boiling, then let them cool before pouring them over the rabbit in a large bowl. 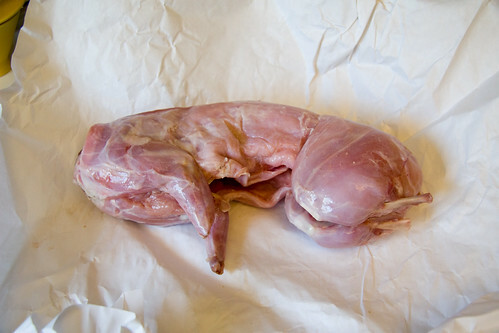 As I prepped the rabbit, I was lucky to discover that it included the kidneys and liver. It only took a few minutes to realize that I should make up a little rabbit pÃ¢tÃ©. 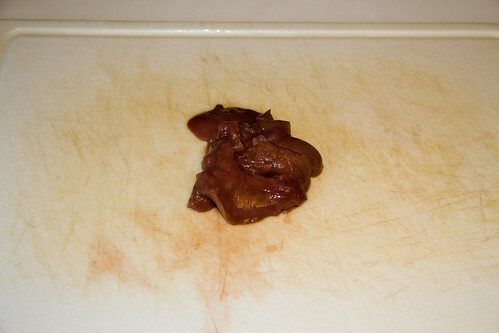 While the rabbit was marinating, I minced a shallot and chopped the rabbit liver into small pieces. 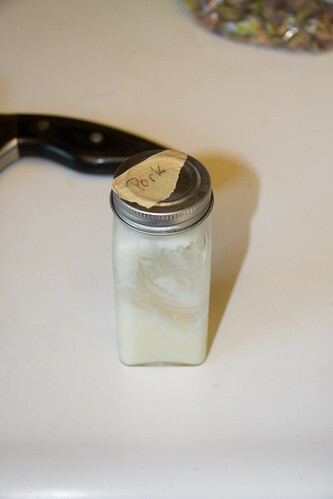 Then I pulled out a jar of rendered pork fat I keep on hand. 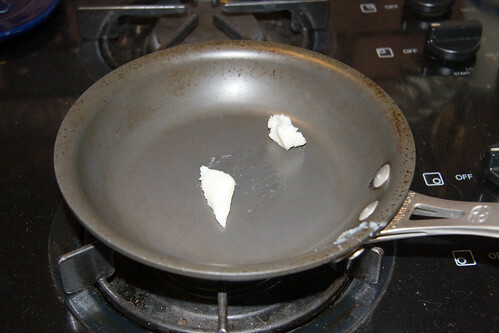 I placed about two tablespoons of pork fat in a small pan to melt. 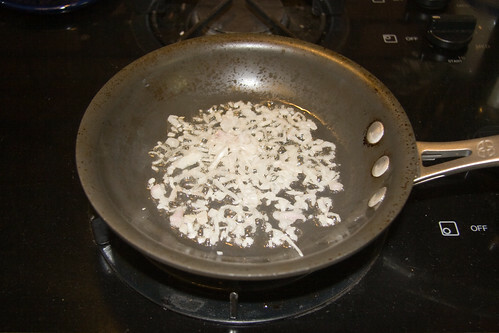 I threw about one tablespoon of the shallots into the pork fat and let them cook a couple minutes. When the shallots became translucent, I added the liver and cooked it for a few minutes until it was done. With the heat very low, I added a splash of cognac and a little fresh ground pepper and some salt. 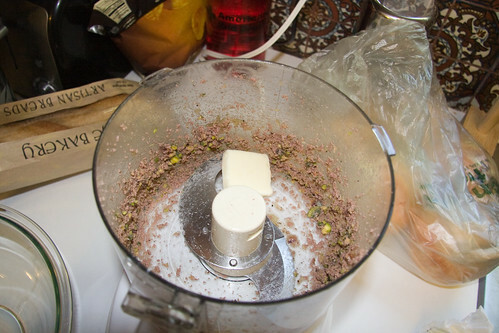 The cooked liver and shallots went straight into the food processor, where I added about two tablespoons of raw, unsalted pistachios. I pulsed the liver, shallots and nuts then added a tablespoon of unsalted butter. A few more pulses and the pÃ¢tÃ© was well blended. I put it in a small glass dish then placed it in the fridge for about 5 hours to come together. My beloved Beaker & Flask frequently features a fantastic rabbit dish where the rabbit is cooked with a nice mustard glaze. With this in mind I whipped up a paste that would stick to the rabbit giving it some extra fat to hold in the moisture while it cooked. 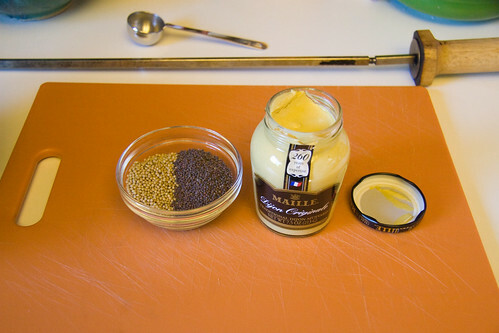 I started with two tablespoons each yellow and brown mustard seeds as well as a tablespoon of dijon mustard. I mixed these with a tablespoon each of butter and salt, and two tablespoons each of olive oil and Herbes de Provence for a thick, flavorful paste. I let the rabbit marinate for five hours, turning it about once an hour. When it was ready for cooking, the wine had turned it a lovely purple. 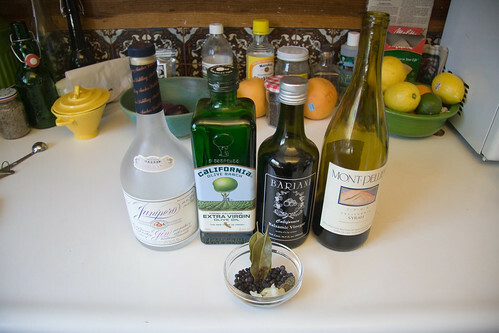 I brushed off the juniper berries and peppers, patted the rabbit dry, then spread the spice paste all over it. The rabbit was now ready to go on the spit. I speared it then secured it compactly in the center. I prepared the Weber for indirect heat with two piles of Lazzari mesquite charcoal, and set the rabbit turning on the rotisserie. 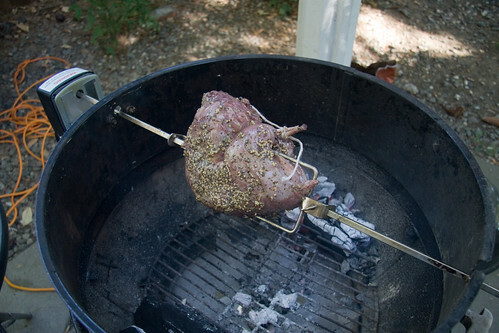 The Weber rotisserie is absolutely one of the coolest cooking accessories I have ever purchased. I use it all the time, with all manner of meats, and it never fails to deliver an amazing meal. It’s worth every penny if you have a Weber kettle grill. To bump the flavor up another notch, I added some pecan wood chips periodically as the rabbit cooked, lightly smoking it. I pulled the rabbit after two and a half hours, removed it from the spit and let it rest about 10 or 15 minutes before enlisting Leon, the purveyor of amazing bacon, to carve it up. 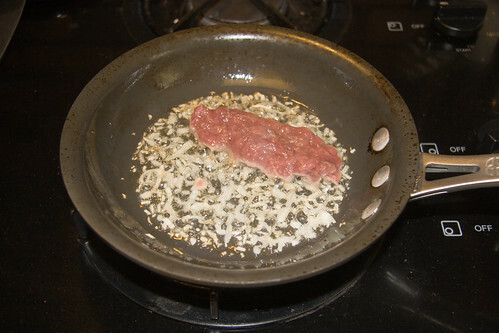 SautÃ©e shallot and liver in pork fat. 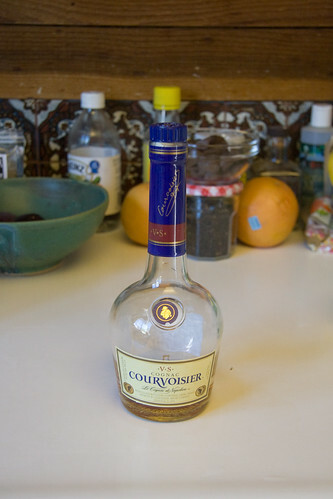 Reduce heat to low, add cognac, salt and pepper. Remove from heat and place in food processor. 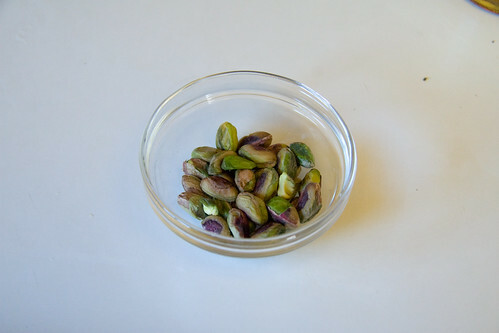 Add pistachios and pulse until well mixed. Add butter and pulse again to combine. Place in small dish. Chill for at least 5 hours before serving. 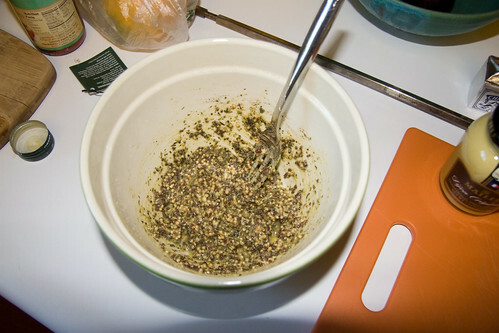 Combine marinade ingredients in a pot. Bring to a boil then cool to room temperature. 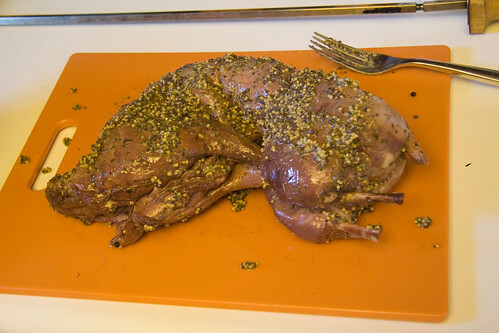 Pour marinade over rabbit in a non-reactive container. Cover for 5 hours, turning rabbit as needed to cover evenly. 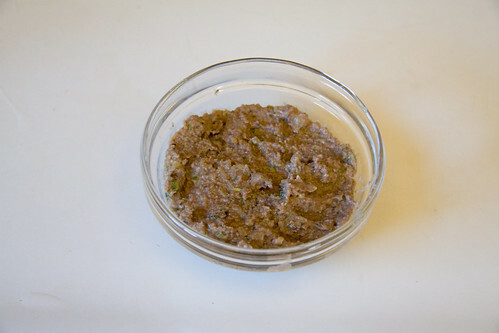 Mix paste ingredients in a bowl until well blended. 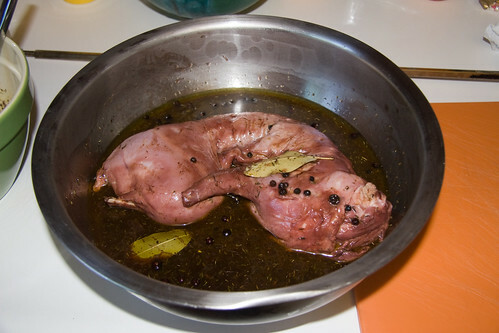 Remove rabbit from marinade and pat dry. Cover all sides with paste. Thread rabbit onto spit and secure tightly in center. Tie legs together if necessary. Cook over indirect heat for two and half hours. 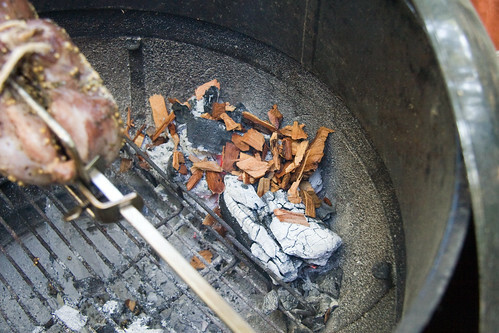 Add pecan chips and mesquite as needed to maintain smoke and heat. 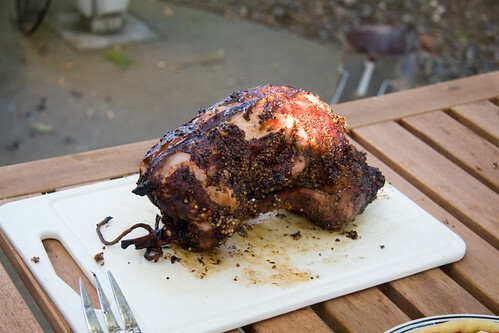 Let rest 10 minutes before carving. All the photos can be found here.